Scheduled to last 18 months, this definition study aims at preparing the development and production contract for the future system meeting the operational requirements of the Turkish Air Force. 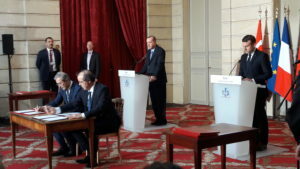 The contract was awarded by the SSM (the Undersecretariat for Defence Industries), which is responsible for acquisitions under the President of Republic of Turkey, jointly to Turkish companies Aselsan and Roketsan, and to the Franco-Italian consortium Eurosam; backed by its two shareholders MBDA and Thales. The contract follows on from the Heads of Agreement signed by industry on 14 July 2017 and the Letter Of Intent signed by the French, Italian and Turkish Defence Ministers on 8 November 2017. This study paves the way for the launch of a three-country joint Long Range Air and Missile Defence Program. The future system will be ready by the middle of the next decade with a state-of-the-art military capability designed to counter the most challenging threats (stealth aircraft, UAVs, cruise missiles, and ballistic missiles). The system is expected to meet three countries’ basic operational needs and it will guarantee Turkey has full employment autonomy and will allow a sovereign choice of integration level within NATO. The joint development activity is expected to support Turkey’s indigeneous air and missile development programme in addition to opening up prospects for exports and longer-term co-operation of Turkey, Italy and France.